Combine everything in a pitcher and let it sit for at least an hour and preferably overnight. Serve in glasses filled with ice and garnish with whatever you have on hand, like fresh mint and tiny umbrellas. Enjoy! Now that I’ve listed out all these ingredients, it does look a little ridiculous. But Tiki drinks are, by their nature, a little ridiculous, so I’m in good company. Like I said, this took a little bit of experimenting. We tried a mix of rums, but found that the Sangria swallowed up the delicate nuances of all the different rums. So we decided to stick with just one aged rum, in place of the traditional brandy. And we replaced the classic orange juice with pineapple, to add a depth of tropical fruit to the Sangria. But the real magic is in the layers of sweeteners. The cinnamon and allspice lend very subtle, but distinct spice notes. The guava is one of my favorite ways of adding earthy, tropical fruit to a drink and works the same here, a subtle but distinct fruitiness. And the orange blossom water, while not a sweetener, adds an exotic floral quality that is reminiscent of orgeat, that Tiki staple that blends sweetened almonds with orange blossom water. No one is going to mistake this for a rum-heavy Tiki cocktail. It’s still very distinctly a well-integrated Sangria. 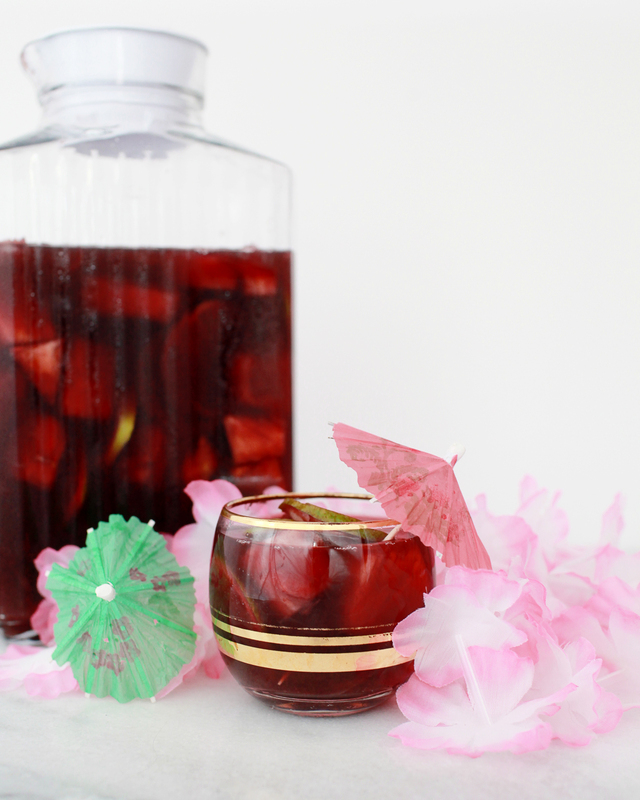 But it’s a Sangria with lots of classic Tiki flavors bouncing off each other in every sip. So maybe it’s a little bit livelier than usual.